Win or lose, CSUSB Athletics has the support of superfan Stephan Johnson. Johnson is not just any fan, he is CSUSB’s very own Coyote Man. If you have ever attended a Coyote home game, you most likely have seen an energetic fan dressed in a blue sweatsuit repping Coyote gear. You can find him at every game. It does not matter what sport or time of day, Coyote Man will be there supporting his squad. What sets him apart from the ‘regular fan’ is his devotion to Coyote Athletics. He is full of positive energy and excitement and not afraid to show his passion for the student-athletes. His energy does not go unnoticed. “He has so much energy and is constantly getting the crowd involved in every play of the game,” stated Coyote Athletics fan Joshua Bayliss. 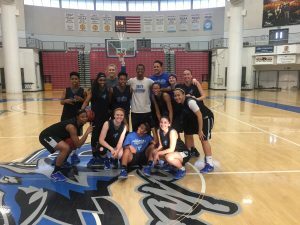 The student-athletes here at CSUSB describe him as the sixth-man of their teams. “Steph’s support definitely means a lot to me because even if I’m having a rough day, he doesn’t ever doubt me!” stated women’s soccer player Rachel Figg. 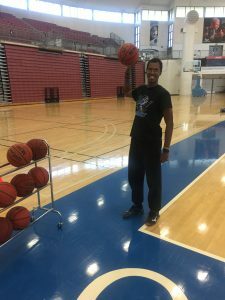 He volunteers with the basketball, softball, volleyball and baseball teams at their practices. He helps shag balls, keep time and motivate the teams. Coyote Man with the women’s basketball team at practice. He is even known to give motivational speeches in post-practice huddles. “He’s definitely someone that keeps the spirits and attitudes up no matter what the circumstance or outcome,” stated women’s basketball player Lee Lee Owens. “Win or lose he’s our biggest fan,” added Owens. He has been to almost every home game for all sports since 2014. The only reason he says he would ever miss a game would be because he was sick or had a family emergency. He is best known for his dance moves and claims he has been a dancer since he was just 13 years old. Anything from a player making a shot to the other team turning the ball over, the Coyote Man uses that as motivation for his dance moves. He will run up and down the court/field in support of the teams. With student-athletes coming from all over California, some don’t have the support of their families at the games. “He’s so supportive, just as if he was my own family,” stated women’s basketball player Sabrea Coleman. “I appreciate his energy and support so much, and he doesn’t even know it,” added Coleman. He interacts with the fans and is a huge hit with the kids in the crowd, and always creates a fun environment. He has multiple handshakes and dances with the kids. He recently celebrated his 30th birthday on Feb. 1, so if you see him around campus or at the next home game be sure to congratulate him. Whether you’re a fan of CSUSB Athletics, or just go to the games for the social aspect, keep an eye out for the Coyote Man. His positive attitude and extreme school spirit is contagious.